It’s Valentine’s Day and I’m on bus number 125 heading to the up-and-coming Florentine area of Tel Aviv. Surrounded by graffiti, grungy construction zones and some of the best hummus joints around sits Veed.me, the startup where I’ll be working for the next eight months. I’m wearing ripped jeans, a print t-shirt and converse. I jump right into the action — strategy discussions, content ideas, product testing, and more importantly, giving my opinion on flower arrangements for significant others. It’s Valentine’s Day and I think I’m in love. With my surroundings, my new coworkers, and my decision to leave my life in Canada behind to experience Startup Nation firsthand. Israel is famous for its dynamic tech startup ecosystem, with only Silicon Valley rivaling it in number of startups per capita. In a region plagued with conflict, Israelis have honed the art of problem solving, turning a tiny desert nation into an innovation powerhouse. For a country that has existed for only 69 years, with a population of just over 8 million, this is no ordinary feat. There are countless numbered lists explaining the factors behind this unlikely success, but that’s not what this is going to be. Instead, I want to share a collection of memories that shaped my own understanding of Startup Nation. Reaching up, I grab a bright red, perfectly plump strawberry. It’s growing in the most unlikely of places — in the middle of the Negev desert. Around me, my friends are unearthing purple carrots and snacking on organic cherry tomatoes. We’re about 8 kilometers from the Egyptian border, at “Shvil HaSalat”, the most unique farm I’ve ever seen. 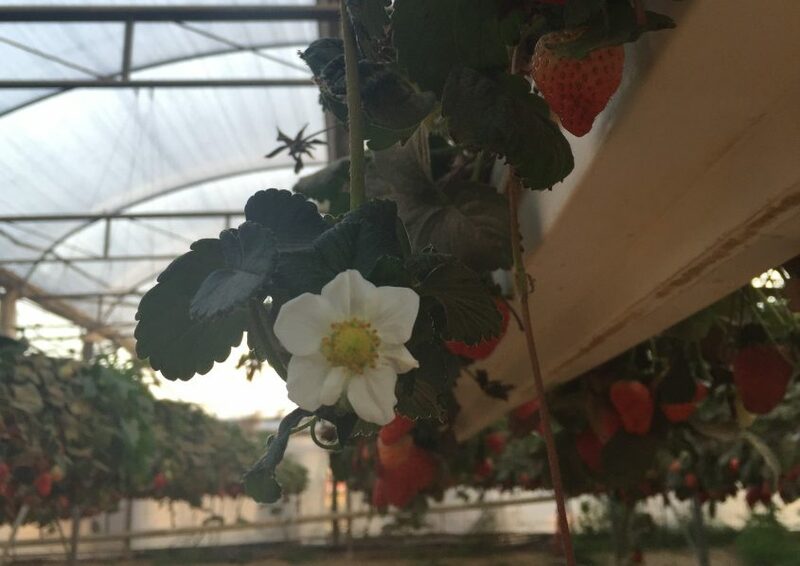 Shvil HaSalat (The Salad Trail) farm is a perfect example of how Israel has made the desert bloom. All the water used here is reclaimed from Jaffa and pumped down to the desert where it’s purified. As a symbol for the country’s collective resourcefulness, the desert blooming proves an apt metaphor. From agriculture to robotics, medicine to security, Israel innovates to make something out of nothing. It’s a sweltering June evening, and I’m unpacking in my new apartment on Dizingoff street. It’s one of the most desirable and lively areas of Tel Aviv, yet, I can see the pub where the 2016 New Year’s Day shooting attack took place from my doorstep. Suddenly, I notice my WhatsApp group chat start frantically flashing with messages such as: “Was anyone at Sarona Market?”, “Is everyone safe? !”, “I was there, but we ran and are safe now”. Pulling up YNet, I learn about yet another terror attack steps from home. The next day, like all Israelis, I go into work without a second thought. It’s business as usual. In Israel, the only thing that’s certain is uncertainty. You wake up every morning and continue your routine, knowing that anything can happen, any time. This is another element that makes Israelis such great entrepreneurs. In entrepreneurship, and particularly in startups, uncertainty and risk are inherent, and you have to roll with the punches to succeed (or get up and keep trying if you fail). In particular, the country’s mandatory army service teaches assertiveness, confidence and how to manage a team. “Combina” is a word that’s often heard in Israel. It’s the ability to improvise in uncertain situations, overcome obstacles, leverage your skills and contacts, and ‘cheat’ the system to get the results you want. I’m on a rooftop overlooking the “white city” skyline and the sea. The sun is setting, and a drone is buzzing overhead. I’m sipping a beer and chatting with a charismatic guy who invented a construction robot. Around us, I hear a mixture of English and Hebrew, Russian and French — and those are just the languages I recognize. We’re at an annual Startup Grind summer party. This doesn’t feel like a typical networking event, though. There’s a different energy here, with a mix of expats, Israelis, fellow startup folks, and even a few soldiers from the IDF intelligence unit. I see young interns pitching to the media and striking up conversations with CEOs — now that’s Chutzpah for you! There’s a collective feeling in Israel that anything is possible. The country itself is a startup, succeeding against all odds. Networking doesn’t feel like networking here — it flows easily and no person, no matter their accomplishments or title, is off-limits. Organizational structures tend to be more flat, and work environments more casual. It’s a breeding ground for creativity and new ideas. I hobble out of the Gett taxi, limping towards the walk-in clinic. I can’t see exactly where it is in the plaza and my sprained foot is not up for a long search. There’s a man enjoying a smoke break outside a pizzeria. He asks if I’m OK, drops his cigarette and takes my hand to help me to my destination. Next thing I know, he swoops me up in his arms, “This is easier”. He gently sets me down by the elevator, presses the button for the clinic floor and wishes me a speedy recovery. Completely dumbfounded, I can’t thank this kind stranger enough. This sums up Israel: everyone feels responsible to help. The startup community is especially supportive and willing to offer advice, mentorship, and assistance. People say that in Israel anyone is only two phone calls away, and everyone has 30 minutes to help you think through a challenge. I found this to be spot on, both in my professional and day-to-day experience. Whether you’re standing together during the Yom HaShoah siren, completing reserve duty, raising kids, or growing a startup, Israelis are in it together in this crazy place we call our homeland. This piece was originally published in The Canadian Jewish News (CJN), as one of the winners of their young writers contest.